An hour of very gentle, dreamy background music for meditation, relaxation, self hypnosis and sleep. 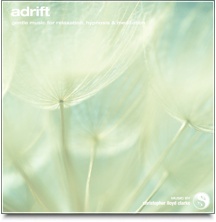 Whenever you're in the mood to relax, soften your mood and lift the atmosphere around you, Adrift is the perfect music choice. Our Suggestion - listen at a quiet volume with your eyes closed and notice how it makes you feel.